Rounding Jeremy Point into Wellfleet Harbor, mariners in Cape Cod Bay are cautious. There, marked on all the charts, are the sandy fingers of Billingsgate Shoal – or, as it was once known, Billingsgate Island. 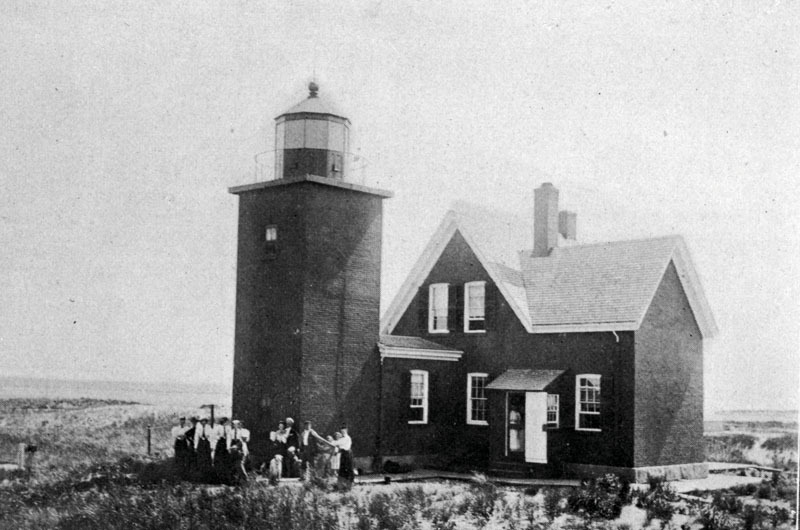 In the mid-nineteenth century, the island was a mile long, a half-mile wide, boasted thirty homes, a lighthouse, schoolhouse, and a flourishing fishing fleet. Fed by a steady supply of sand from the inner forearm of the Cape, Billingsgate was for centuries terra firma, a charming coastal haven welcoming sailors to Wellfleet. 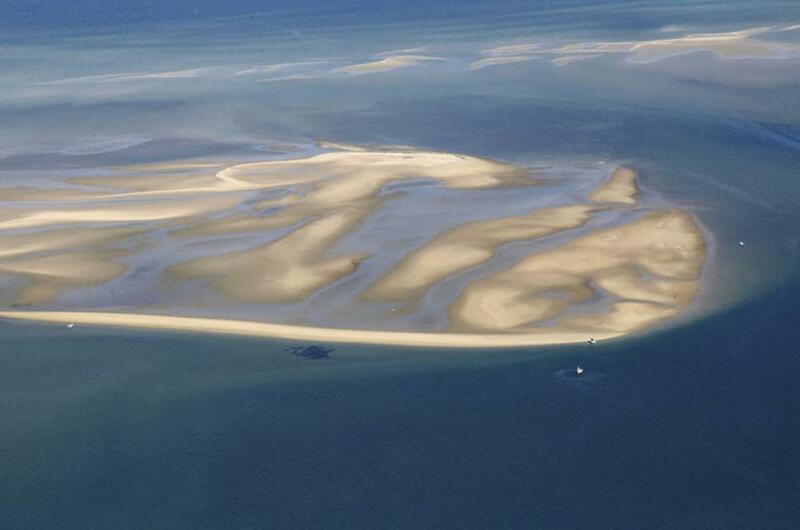 When the dynamic forces that kept the island awash in sediment shifted, it began to disappear. When the community desperately added a breakwater made of riprap to protect its lighthouse, the island all but vanished overnight. Today that breakwater is visible at low tide, the last vestige of an island that was a familiar beacon of the inner Cape for centuries. Billingsgate Shoal in Cape Cod Bay. The Vineyard is safe from the fate of Billingsgate – but only for a time. 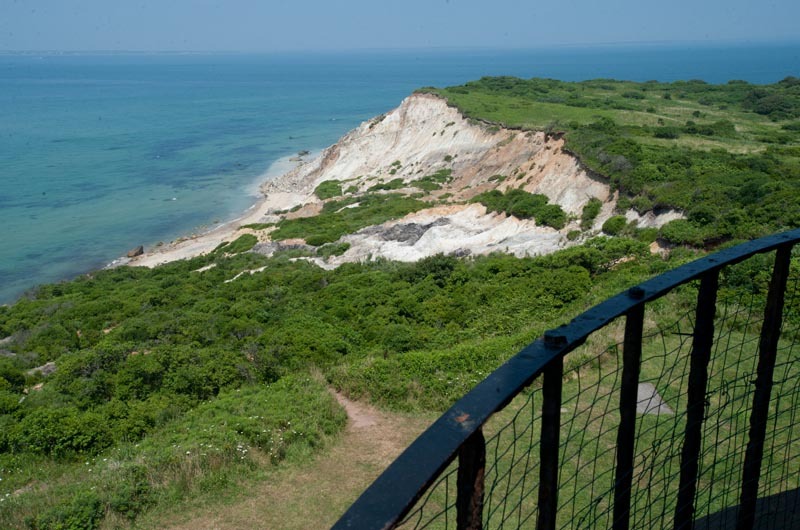 Since the end of the ice age, the pile of glacial outwash and sand known as Martha’s Vineyard has been wearing away from its original shoreline on the continental shelf some eighty miles south, to its present, temporary boundary. The Cape and Islands will eventually erode away to nothing – they were never meant to stick around. According to a 2000 study by the Federal Emergency Management Agency (FEMA), the United States can expect to lose 87,000 structures to erosion within sixty years. That works out to 1,500 structures lost each year, at a cost to homeowners of $530 million per year. In Massachusetts alone, 36,000 homeowners live within five hundred feet of the shoreline. “There’s this divide between climate scientists and coastal geologists, and then policy makers and private property owners. In many respects, those two are speaking over each other,” says Mr. Kahrl. On Chappaquiddick, the Schifter family is sinking millions into a massive engineering project to buy a few more precious years for their house. In Oak Bluffs, eroding seawalls and bluffs threaten infrastructure, leaving residents to wonder who will pay for costly repairs. The Vineyard’s vulnerable geology, coupled with the specter of sea level rise, means that the sort of drama currently unfolding around the Island will only become more common. The particular phenomenon of coastal erosion currently besetting the Vineyard is staggeringly complex. First, as mentioned, the Vineyard is made mostly of sand and glacial till, and wave action has been steadily eroding the Island since its relatively recent creation. Third, the waters around the Vineyard are rising – almost a foot in the past century, according to tide gauges. But sea level rise is not a simple affair. The oceans are rising both from the onrush of glacial meltwater as well as from thermal expansion as the waters warm (in April, the National Oceanic and Atmospheric Administration [NOAA] announced that sea surface temperatures in the Northeast Atlantic hit a 150-year high in 2012). And according to a study by the United States Geological Survey published last fall in Nature Climate Change, sea levels between North Carolina and Newfoundland are rising three to four times faster than the average global rate, due to the slowing of the Gulf Stream, which is tilting the ocean back toward our shores. In Aquinnah, different sort of erosion is threatening lighthouse. In Aquinnah, where the town is scrambling to move the historic Gay Head lighthouse back from the edge of a crumbling cliff, another kind of erosion altogether is at work: Rain is slowly washing the clay down into the ocean. Of course all of this erosion is nothing new. Recently in Chilmark, where several homes are imperiled, a lifelong Islander recounted how he had attended a wedding “out there,” pointing to an imaginary point a hundred feet offshore. There is an uneasy sense that things have been picking up in recent years. At the end of May, The Trustees of the Reservations superintendent Chris Kennedy surveys the Wasque swimming beach, a landscape utterly transformed by erosion, driven mainly by the forces at work since the breach of Katama Bay in 2007. The tip of Norton Point now extends to run parallel to the south-facing shore of Chappaquiddick. He stands at the edge of a hundred-yard-wide, debris-strewn sandy beach, protected by a lagoon with wave-blasted sandbars, behind which the tide pushes the water in a gentle river in and out of Katama Bay. A year ago the same beach was an impassable sheer cliff face with waves crashing against a snarl of oak trees that had toppled from above. The changes have rendered maps of the area useless. Mr. Kennedy says that Wasque’s latest erosive episode likely had little to do with sea level rise or climate change, because it is almost identical to previous breach openings. But after a winter that saw the beach lose twenty feet in a single storm, he’s apprehensive about the future. Past a bewildered gray seal pup, the beach narrows at its eastern tip near Wasque Point, culminating in what looks like a mountain of enormous sausage links. These are essentially giant sandbags installed to help protect the six-year-old, 8,300-square-foot house of Washington, DC–based private equity partner Richard Schifter, who has lost 150 feet of shorefront property in the last year alone. But the coir bags are not as sturdy as they look. Made from coconut husks and filled with sand, they are designed to steadily leak away all of their sand, so as to supply sediment to downdrift beaches – acting like an artificial coastal bank, and buying time for the Schifter house as it is relocated 275 feet back from the deteriorating shoreline. The bags are increasingly showing up in coastal areas where public officials have learned from decades of misguided attempts to save beachfront property from erosion; armoring the coast with engineered structures has effectively destroyed the beaches they were meant to protect. While the rapid loss of beach at Wasque Point may be deeply troubling to the Schifters, it’s a source of endless fascination to Woods Hole Oceanographic Institution coastal geologist Gregory Berman, who has surveyed the area several times. The glaciers reached their furthest extent, the so-called terminal moraine, a little more than twenty thousand years ago. There they continuously melted, dumping material along the line that would form the spines of Martha’s Vineyard and Nantucket. After a quick retreat and pause along the spine of the Cape, the glaciers hightailed it north. Long before it was a buzzword, sea level rise was a very real phenomenon: Over the past several millennia the oceans have risen about four hundred feet. “As that land has been submerged and the beaches have been rolling back on the islands, they’ve been able to do it because people haven’t been in the way,” says Berman. “If someone had built a revetment or a seawall around their house five thousand years ago, they’d be fifty miles offshore by now.” What we were given by the glaciers is what we’ve got, and we’re not going to get any more. This isn’t the case for other, luckier, ocean-facing communities. Sand-stuffed coir bags line Schifter property. In such a system – where the beach itself has to erode to supply sand elsewhere – when a homeowner armors their property with rocks or seawalls, the demise of the beach and the beaches around it are inevitable. It might seem counterintuitive, but unimpeded natural erosion in these parts is generally a good thing. Still, the record of failed beach armoring projects in the region is impressive, if entirely predictable. 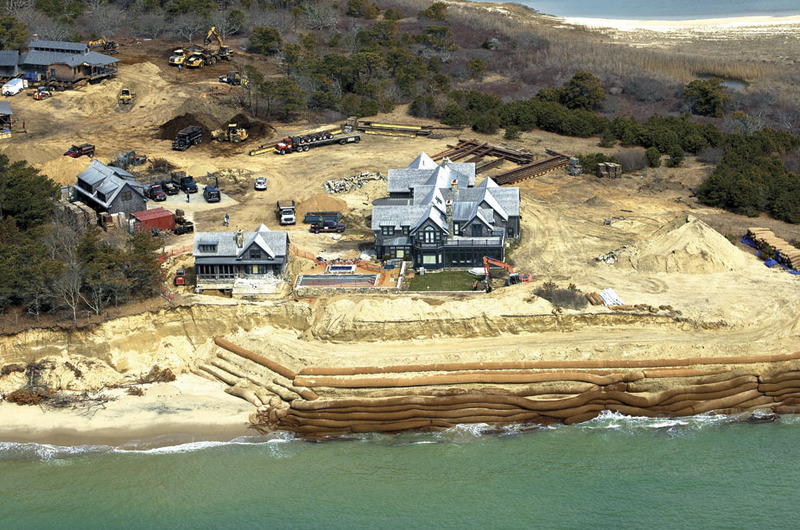 In Chatham, after a breach of Nauset Beach in 1987, homeowners north of the breach, alarmed by the quickening pace of erosion, built a revetment in front of their houses along shoreline owned by the US Fish and Wildlife Service. The Fish and Wildlife Service approved the plan, provided the homeowners maintained a six-foot-wide sandy beach. It quickly became apparent that such an aim was futile. Today, in place of a public beach, there is a long stretch of stone lapped by the Atlantic. Mashpee has similarly lost a large stretch of its Nantucket Sound beach after revetments were installed to protect houses. Seawalls and revetments are doomed to eventually fail. When a seawall beach erodes away, as it inevitably does, the waves begin to hit the seawall directly. The energy from this direct strike is damaging enough, but it is also reflected sideways (scouring adjacent beaches) and downward (scouring the sand underneath the wall until it becomes unstable). Beach habitat disappears, as does public access, and, according to one study, while property values for the first row of houses on the water remain intact, those behind it suffer. The South Shore town of Marshfield draws parallels to Oak Bluffs, where the beach adjacent to the Steamship Authority pier has disappeared, the seawall is crumbling, and the engineered East Chop bluffs are becoming unstable. Marshfield is coming to grips with the financial ramifications of a heavily armored coastline. In April residents voted to spend more than $4 million to repair a thousand feet of crumbling seawall guarding a row of houses perilously close to the water. Other than a wholesale abandonment of the coast, there is little choice for communities like Marshfield that built out their waterfront before the age of smart coastal planning. On Martha’s Vineyard, town boards have, for the most part, rejected beach armoring in recent years, most notably in West Tisbury, where town officials struck down a proposal for a 135-foot revetment at the Tisbury Great Pond estate of Wall Street financier Wesley Edens. But there are ways to fight Mother Nature other than fortifying the coast. Nourishment, or constantly supplying the beach with sand that is trucked or shipped in, is one way to stem the tide of erosion. The poster children for beach nourishment are Miami, whose coastline is entirely artificial, and the New Jersey shore, which is coming to grips with how much to redevelop in the wake of Hurricane Sandy. “In New Jersey or Florida you have a huge property-tax base because the condominiums and buildings are stacked tall and densely packed. The Army Corps of Engineers will do an analysis to see: Is it worth building a sacrificial dune along a twenty-mile stretch? You need that kind of density to make it economically reasonable,” says Mr. Berman. “You guys don’t have that,” he adds about the Vineyard. Even if it were economically feasible, beach nourishment comes with other, less obvious complications. Florida is arguably the most important state in the country for nesting endangered sea turtles. The gender of sea turtle hatchlings is exquisitely sensitive to sand temperature, and imported sand that is the wrong color can absorb more or less heat, throwing an artificial variable at an already vulnerable population. Florida also imports huge quantities of sand from the Bahamas, stirring resentment in that island nation. Closer to home, beach nourishment projects have run into permitting trouble, notably on Nantucket, where Codfish Park on the eastern shore has seen more than twenty houses fall into the sea in the past two decades. Amazingly, the shoreline of Codfish Park has actually accreted overall by a few feet since the mid-1800s, a testament to the beach as a place of dynamic equilibrium, always eroding and accreting without regard to property lines and artificial borders. What went wrong was that Nantucketers built entire rows of houses during an accretional cycle that lasted until the 1950s, only to see that land mercilessly churned up and returned to the sea during an erosive period that has lasted until the present day. Where two rows of houses in Codfish Park stood as recently as the mid-1990s, a natural dune has re-formed and taken their place. Sarah Oktay is the director of the University of Massachusetts Nantucket Field Station, the chair of Nantucket’s newly formed coastal management planning committee, and a member of the Nantucket Conservation Commission. The commission has repeatedly blocked the efforts of the Siasconset Beach Preservation Fund, a group of private homeowners who have put forward a number of elaborate proposals to save their slice of heaven on the island’s eastern shore. Ms. Oktay can sympathize: One of the buildings on her own property is thirty-nine feet from an eroding bluff that lost ten feet in just a few months, while another has sunk into an adjacent marsh and is condemned. She reports that the conservation commission receives one or two proposals a week for erosion control projects. But it was the Siasconset Beach Preservation Fund’s large-scale beach nourishment proposal that was perhaps the island’s most contentious. The private homeowners group proposed spending $25 million to dredge sand from three miles offshore and dump it on a three-mile stretch of rapidly eroding beach. “A lot of the year-rounders and old-timers were like, ‘Listen, we always put crappy homes by the shore,’” she says. “A lot of them thought it was hubris – that you shouldn’t build too close to the shore in the first place.” But it wasn’t hubris that sunk the Siasconset Beach Preservation Fund’s plan to save their homes; it was the concerns of fishermen, who formed a nonprofit organization to fight the plan. Whereas off of Florida there exists an enormous industry of sand miners, with armies of boats panning the seafloor with side-scan sonar and multi-beam bathymetry looking for new beds of sand to exploit, in Massachusetts offshore sand mining is practically taboo. The state Division of Marine Fisheries has balked at sand mining for even small-scale nourishment projects. Underwater, just off of Siasconset Beach, is a complex seafloor habitat of cobblestones and larger rocks that were left behind when previous coastal banks eroded. Fishermen complained that by dumping more than 2.6 million cubic yards of sand on the beach, as the homeowners proposed, they threatened to bury one of the most important fishing grounds. Ultimately the Beach Preservation Fund dropped the proposal. Ms. Oktay, a chemical oceanographer, says that beach nourishment is not a sound solution for a coastal environment as rich as that of the Cape and Islands. Still, there are successful beach nourishment programs even on the Vineyard. The Cow Bay Association in Edgartown, a private homeowners group, buys sand from the town of Oak Bluffs to combat erosion near Eel Pond. That sand is dredged from a channel in Sengekontacket Pond, part of an effort to improve water quality for the town’s shellfish beds. But even that project has endured an endless slew of permitting hurdles by the National Marine Fisheries Service, the Army Corps of Engineers, and the Wampanoag Tribe, and beach nourishment is unlikely to become a panacea for other erosion hotspots on the Island. While it’s impossible to rewind the past half-century, when a newly prosperous and leisured postwar America rushed headlong and often heedlessly toward the sea, communities can still plan for the future. Coastal hazards specialist Maria Honeycutt at the NOAA Coastal Services Center in Silver Spring, Maryland, works with state and local governments providing data on the potential impacts of coastal erosion, storm surges, and sea level rise. But ultimately, she says, it is up to the communities themselves to move forward prudently. Area of Nantucket shoreline loses 12 feet of beach a year. This planning is already quietly underway in Oak Bluffs where, thanks to the help of a grant from the state’s Coastal Zone Management’s Storm Smart Coast program, the town has amended its zoning to discourage building in areas most likely to be flooded under higher seas. Insurance companies, with perhaps the most to lose, are also coming around. In the meantime, one of the least bad options is a retreat from the sea. 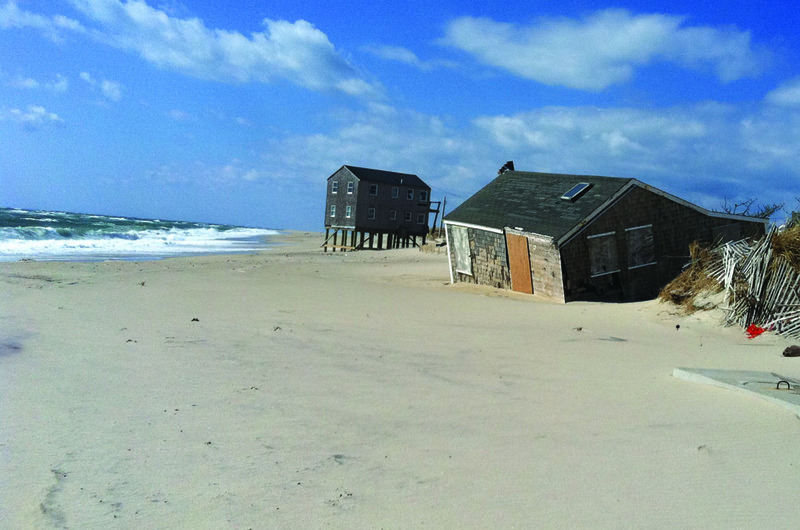 While the Schifters’ move has been ridiculed in some circles for its futility and for its impact on the surrounding environment, moving back is the way Cape and Islanders have historically responded to a ceaselessly marching shoreline. When the original eighty-eight lots of Siasconset were drawn up at the turn of the last century, the Nantucket developer designed the parcels to allow homeowners to retreat inland. In subsequent decades these parcels were subdivided and sold, leaving new property owners little place to go when the sea inevitably returns to collect its sandy tribute.